RYTMO or Reaching Youth Through Music Opportunities is a local non-profit organization in the Anaheim area with the mission to educate, equip, and empower underserved youth through music, technology, and the arts. RYTMO students, ranging from the ages of 12 to 24, gain hands-on experience and personable skills to extend their position in the community and improve their outlook on life. Since its beginning in 2003, RYTMO has been instrumental in improving the lives of thousands of Orange County youth. What set's RYTMO apart is our partnership with the prestigious Berklee College of Music. Every year, RYTMO has had the honor to send students to the Berklee 5 week summer camp where they have the opportunity to learn from some of the best music instructors with the best up and coming artists in the country. Because of our partnership with Berklee, the students receive free tution scholarships from Berklee in order to attend the summer camp. However, RYTMO must fund transportation, room and board for each student attending. This year, two of our most dynamic students Amel Murray and Sophia T. were accepted to attend the five week summer camp and we need your help to get them there. We are estimating that costs for each student will be around $5,000. These costs include round trip flights to and from Boston, Massachusetts, room and board, food, transportation on the ground etc. On June 10th at 1:30pm RYTMO will be hosting the 9th Annual Jazz Generations Benefit Concert that showcases the heart of RYTMO, our students, through the smooth sound of Jazz. Each year this event has gathered family and friends from all across Orange County for a night of fun, food, and exceptional entertainment while raising thousands of dollars towards RYTMO classes, equipment, and most importantly, RYTMO students. 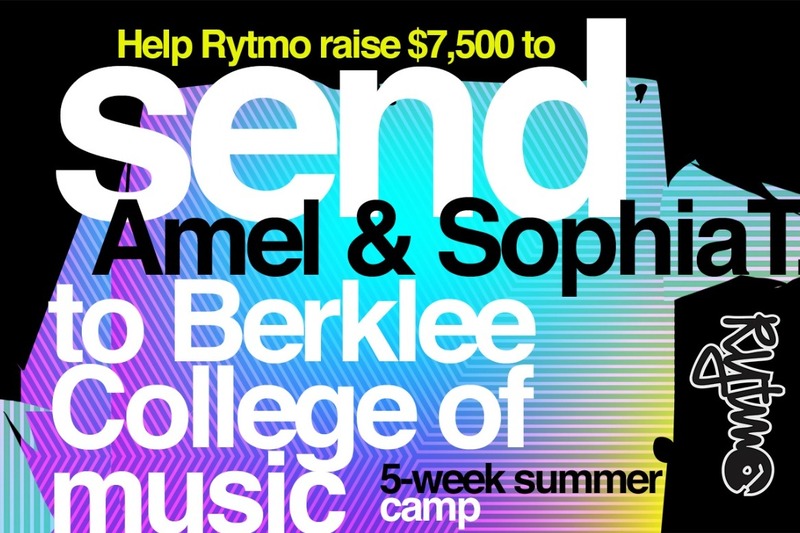 This year, RYTMO students past and present will be performing in order to raise money to send Amel and Sophia to Berklee. Yet, to insure our success and to help send Amel and Sophia off to Berklee with everything they need we are asking for your help! The success of RYTMO and Jazz Generations is made possible by generous donations from people like you. Will you help RYTMO continue it’s legacy of empowering our community’s youth towards their brighter tomorrow? Any dollar amount from $1 and up is a huge help in making our student's dreams a reality. If you can't donate today, please share the link to this fundraiser with your friends and family. Check back frequently to learn more about Amel, Sophia, and RYTMO!